SmartShopper by SmartShopper - Boost Your PC. SmartShopper by Pinball Corporation is a Windows and Internet Explorer side-bar plugin that shows price comparision results by viewing the laoded web pages and extracting product and merchant data and comparing it with prices of affiliate merchants. When checking out of an ecommerce site that is a SmartShopper affilate, SmartShopper will place a browser control in the webpage to show you coupons for the product and merchant. The coupons will show in a floating window and can be added to your cart. Download Boost and enjoy your PC. 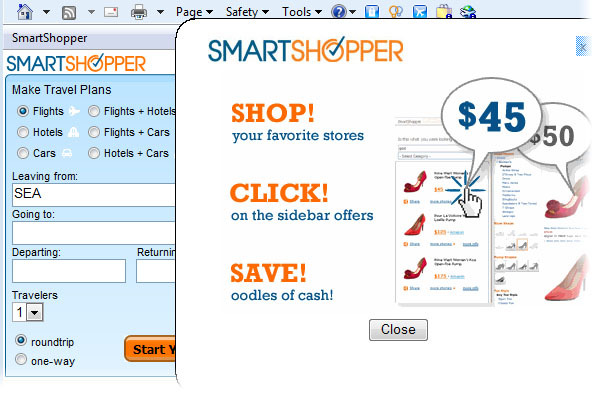 Remove SmartShopper from your PC. Why should I uninstall SmartShopper? This web browser/ Windows sidebar plug-in, like many browser plug-ins, has the potential to cause stability issues within the web browsers they load into, effecting overall PC performance. This toolbar is known to monitor your search queries and browsing habits in order to send you targeted ads and modify your search settings and results. To the right of the list item, click the Uninstall button and Boost will completely remove SmartShopper from your PC. Use Add/Remove Programs control panel in Windows makes to uninstall SmartShopper. Follow the appropriate instructions below to use this control panel. Select SmartShopper from the list of programs, and click Uninstall. Alternatively, right-click the program and select Uninstall. Select SmartShopper from the program list, and click Uninstall. Alternatively, right-click the program and select Uninstall. Select SmartShopper from the list of programs and click Remove. Boost helps you remove SmartShopper and clean your PC.